I had my first lesson with John Hollenbeck yesterday. We got to talking about hooks -- not necessarily hooks in the pop sense, but in the sense of powerful and memorable musical ideas that are also a wellspring of related material for your piece. A hook is what you hang your piece from. For instance, the hook in Hollenbeck's "Abstinence" is the 10-note bass line generated from the pattern of letters in the word "Abstinence." The pitches and intervals in that bass line serve as generative material for the austere initial melody, and for every other element in the piece. Finding a good hook, especially one that lends itself to transformation, often unleashes a torrent of compositional activity. One hook-related idea leads to another and you start to think, "Hey, I've really got something here." But when it comes to structuring the material, there's a strong tendency to want to present the initial "pure" version of the hook first, or at least very early in the tune. It's very tempting to make the order of events in your piece reflective of your compositional process. Sometimes, this is a good thing, as you want a clear initial presentation of your hook so you can guide the listener through the subsequent transformations. (In fact, this is exactly how "Abstience" works.) But, as John pointed out, the initial version of the hook is also often the strongest and most dramatic musical idea in the piece, and by placing the hook up front, you risk making everything that comes afterwards feel anticlimactic. 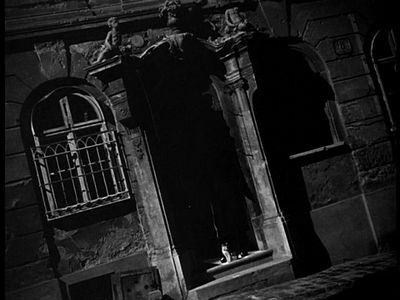 All of this reminded me of the famous Orson Welles entrance in Carol Reed's The Third Man. 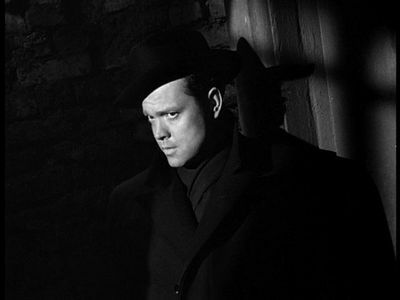 Welles's character, the notorious black marketeer Harry Lime, is the fillm's hook. Everything about the film revolves around him -- indeed, he seems to be all any of the other characters can talk about, despite the fact that he apparently died 10 minutes before the main action of the film begins. Of course, as you know if you read the opening credits, Lime won't be staying dead the whole movie. But he doesn't appear onscreen until over an hour into the 104-minute film. Even then, the first thing we see of Harry Lime is his shoes -- he's standing in a darkened stone doorway, with a cat licking at his feet. At this point, the audience doesn't know it's Lime in that doorway, and neither does the protagonist, Holly Martins (Joseph Cotton), who's alerted to the presence of the man in the doorway by the cat's mewling. The big reveal comes later in the scene, when Harry's face is illuminated by the light from an upstairs window snapping on, and we finally get our first look at the infamous Mr. Lime. Now that's the way to introduce your hook! I just heard something by Henri Dutilleux, whom I'd never heard of before, on the radio, and really liked it, so I looked him up on < a href="http://en.wikipedia.org/wiki/Henri_Dutilleux">wikipedia, and came upon the following: "'reverse variation' by which a theme is not exposed immediately but rather revealed gradually, appearing in its complete form only after a few partial, tentative expositions," which reminded me of this post. So there you go. I've been meaning to check me some Dutilleux. Thanks. I am no music expert, so I drop my random notes on recent links. 1. Paavoharju. absolutely weird Finish psych folk-electronic-ambient...or whatever. Their music is captivating. Somebody has to explain to me why. Cause it sure doesn't sound like one of those super fancy construction to me. (eg. math rock) for example Pepe. A straight up song, but...rip yer soul. 2. Jolie Holland next album sample tracks. Why? Limited voice range, simple lyrics. She doesn't do a lot of clever circus tricks, except the long legato and amazing phrasing... mellow and flowing gracefully. 3. I think in the end detail & craftmanship matters. That alone can do almost anything.